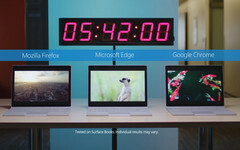 A recently-posted video shows the Edge browser beating Chrome and Firefox in terms of battery efficiency. It comes as no surprise, though; the test was run by Microsoft, which develops Edge—hardly an impartial observer. With the worldwide release of its Windows 10 Creators Update underway, Microsoft just couldn't pass up on the opportunity to show off how much better its Edge browser is compared to the competition. The company has posted a new video on YouTube that demonstrates its battery-saving abilities. The test featured in the time-lapse video doesn't go into too many details. It essentially pits three Surface Books running three different web browsers against each other. One laptop uses Google Chrome, another Mozilla Firefox; Microsoft's own Edge browser runs on the third laptop. The three devices play a continuous video loop on their screens, awaiting the moment when their batteries finally give in and the laptops shut down. Unsurprisingly—this is a Microsoft-run demo, after all—the Edge handily beats its two competitors, one of them in decisive fashion. The first to surrender is the Surface Book running Firefox; it lasts slightly over 7 hours before it runs out of juice and shuts down. Google Chrome is the next victim, although it puts up roughly an additional 2 hours-worth of fight before it, too, succumbs to its need to feed (off the power outlet). How long, exactly, did the Edge last? 12 hours, 31 minutes, and 8 seconds. That is 77 percent longer than the notebook running Firefox and over one-third more time than its Chrome-wielding counterpart. 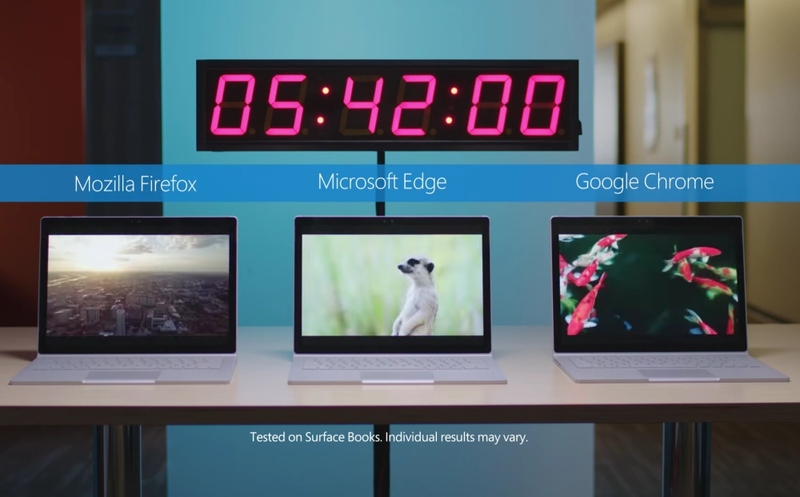 Microsoft concludes the video by designating Edge as the "faster, safer browser for Windows 10." Now, had either Google or Mozilla run this test in a controlled environment of their making, would Microsoft's Edge still have come up on top? What if the test had been conducted by an independent third-party? I'm sure we'll see answers to these questions soon enough. At the very least, Microsoft has provided a summary of the methodology used to conduct its demonstration; it can be read here.